Happy Friday! I hope that everyone has had a great week. I don't know about you but I am ready for the weekend!! 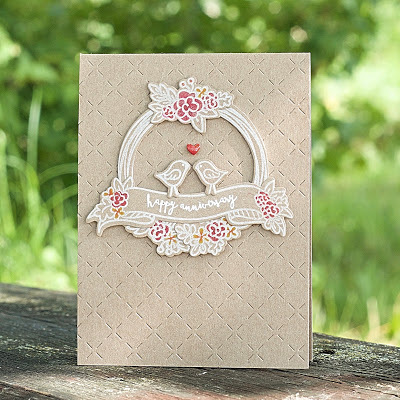 This gorgeous card by Vilena that I spotted this week will start our weekend off on the right foot!! I absolutely love the look of white on kraft. It is so sophisticated and pretty! For more inspiration and details be sure to check out Vilena's blog here. Hello! 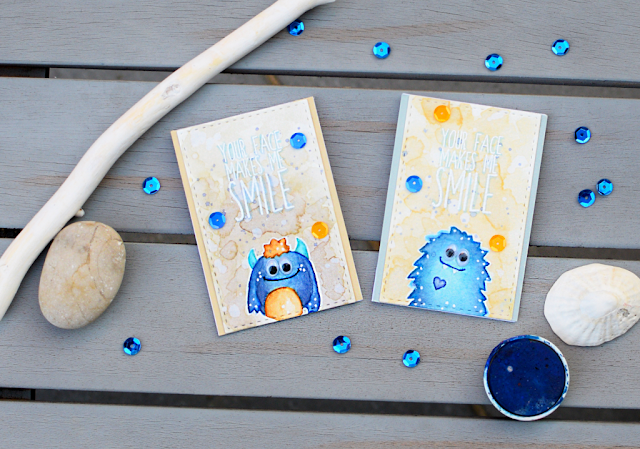 Check out this adorable set of mini cards that we spotted that were created by Sabina. I love how the monsters look colored like this. These are just the cutest!! 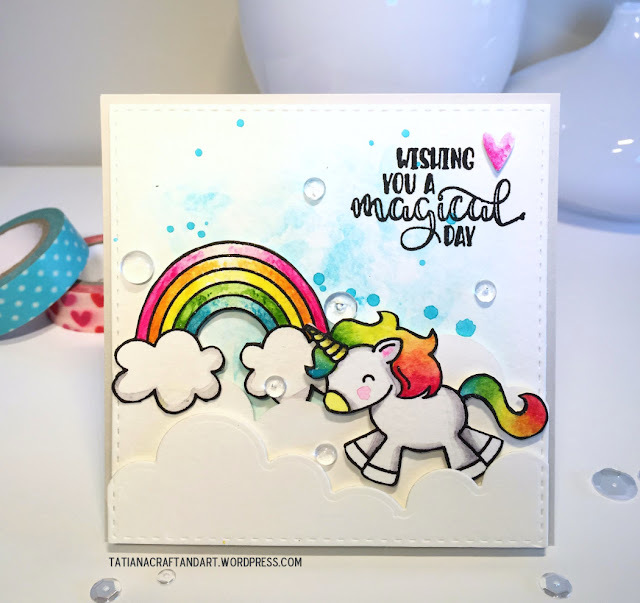 For more information on how Sabina created them be sure to check out her fantastic blog here. Have you seen the cards that we have spotted that are created by YOU this week? If not you may want to check our previous posts. Our customers are so talented and are just the best!!! Thanks for stopping by to take a peek. Have a great day! Today I have another terrific card to share that is created by YOU, our fantastic customers! I love how cute and sweet this card by Amy is. The ink shaded background is just gorgeous. For more information be sure to check out Amy's blog here. You will be sure to come away inspired!! I hope that everyone is having a fantastic Tuesday!! I wanted to share some more cards this week that we have spotted across the web that are created by YOU, our fantastic customers!! Today I wanted to feature this adorable and magical card by Tatiana. I just love how bright and cheerful it is!! Isn't it fantastic?! For more details be sure to check out her blog here. I am also happy to announce that the winners of our Pretty Pink Posh Blog Hop last week are Sensenom00 and and Colleen Howell! Congratulations!! I love this card!! Nice whale!! Each have won a $25 Gift Certificate to Avery Elle. Please contact us at customerservice at averyelle dot com so that we can get your prize to you. 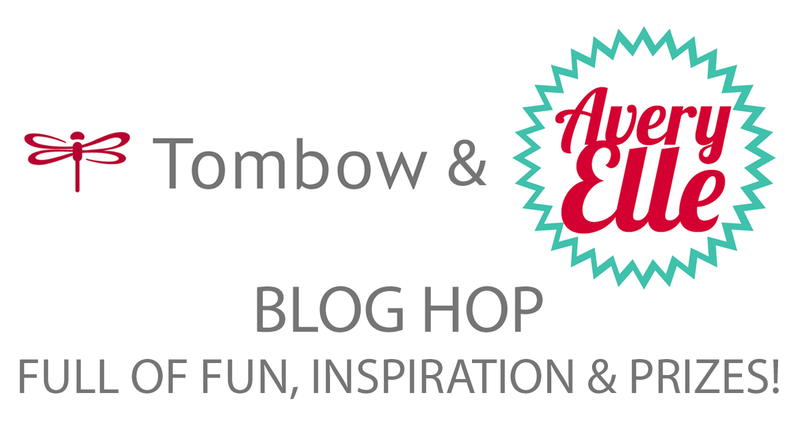 Hello and welcome to the Tombow USA and Avery Elle Blog Hop! We have teamed up with our friends at Tombow for a collaboration full of fun, inspiration and prizes! You have arrived at the start of the hop so let's get started! I created this pretty card using Tombow's Irojiten colored pencils. They are just lovely and the colors I used were so pretty and soft. They have so many colors, so be sure to check them out. 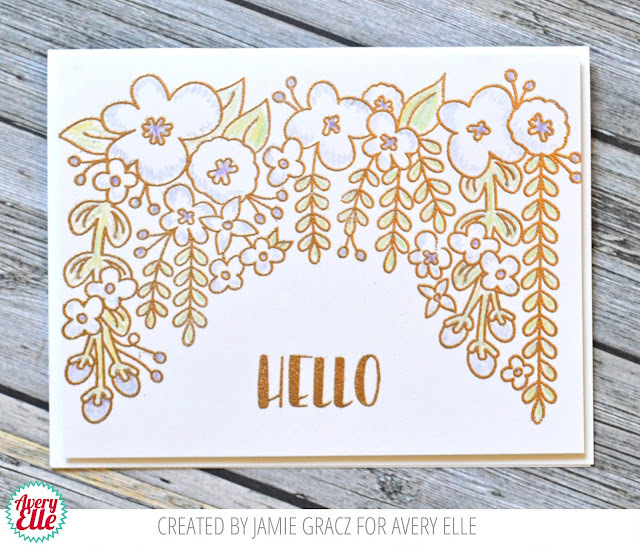 I stamped and embossed our stamped image in gold embossing powder and used the pencils to shade and highlight the flowers and leaves. Very clean, simple, easy and pretty. PRIZES! Comment on any or all of the Designers’ projects for your chance to win a prize you are guaranteed to fall in love with! 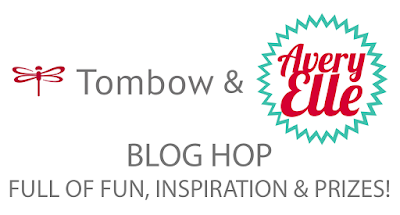 One lucky winner will get BOTH a $50 Gift certificate from Avery Elle and $50 worth of Tombow Adhesives! We will announce the Winner on August 1st via our Social Media outlets! You are off to the Tombow blog next. Happy Hopping!! Hello and Happy Friday! I hope everyone has had a wonderful week! I have some fabulous cards to share with you to start our weekend off right! Take a peek!! 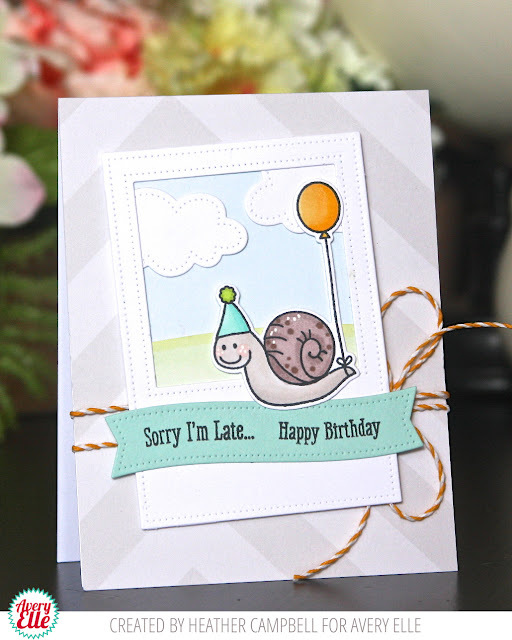 Karolyn created this first card and I just love how she paper pieced the snail. This is a great way to add depth and interest to lined images. The snail looks great inside that square frame that Karolyn created. I love it! 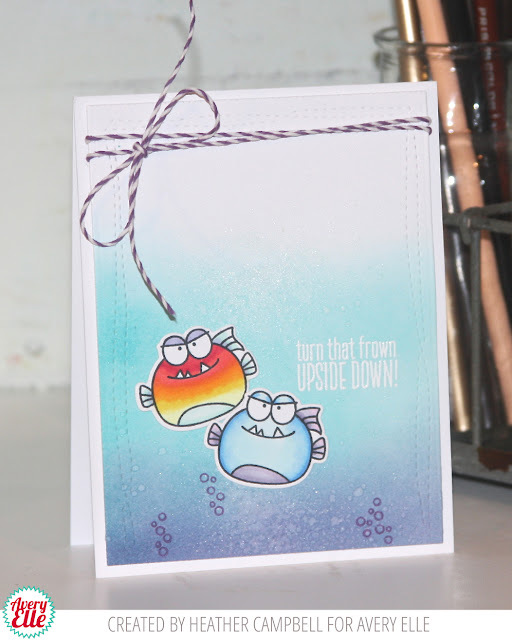 This next card by Karolyn is so fun. 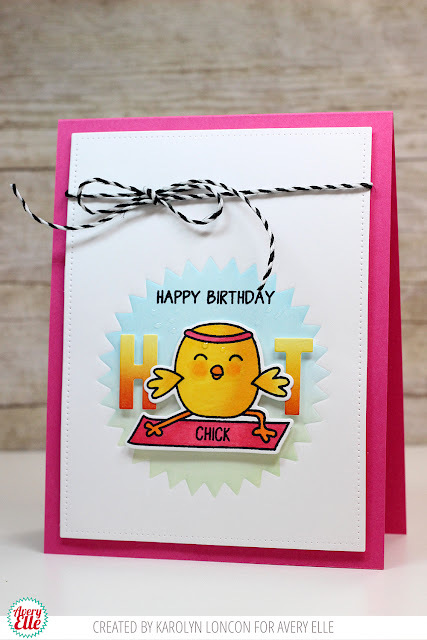 I love love love how she used the chick as an "o" in the word hot. This is so clever! Katie created this next card. I love how she took a simple water colored background and added the pink flamingos on top. The small rain drop accents are a great finishing touch. This last card by Katie is terrific. 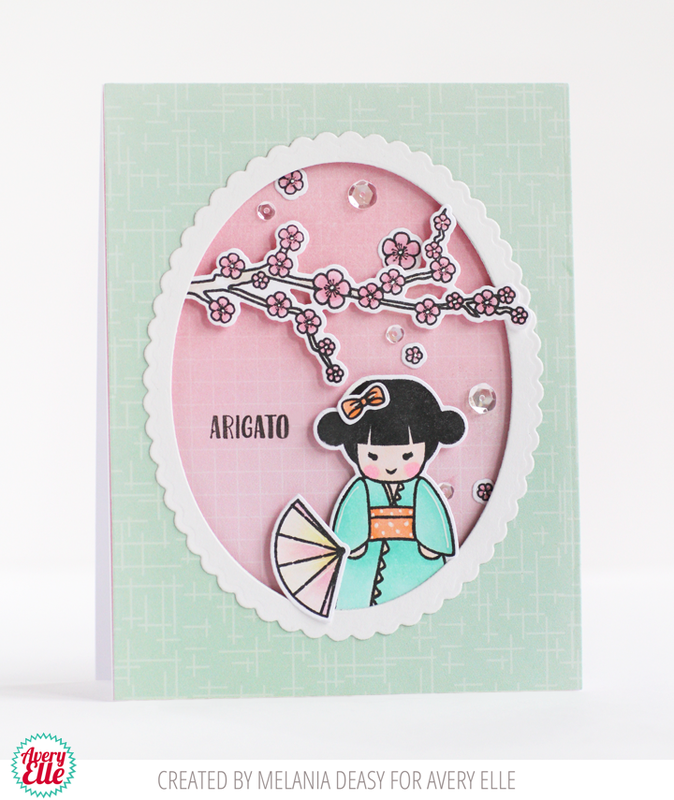 Check out how the cherry blossoms look stamped on an angle on the red card base. I love little details like this. Thanks Katie and Karolyn for sharing with us today. I love your projects as always! Thank YOU for stopping by to take a peek. Have a great day! 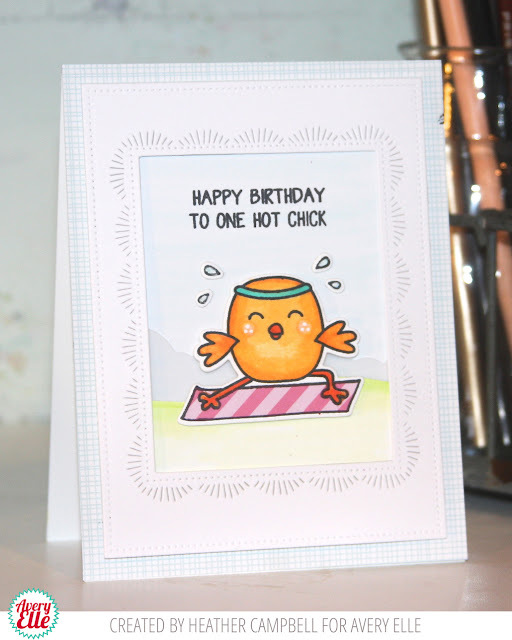 Ashley and Heather are on the blog today with some really cute cards. Check it out!! Ashley created this first card. I love how the bright sea life looks against those white panels. 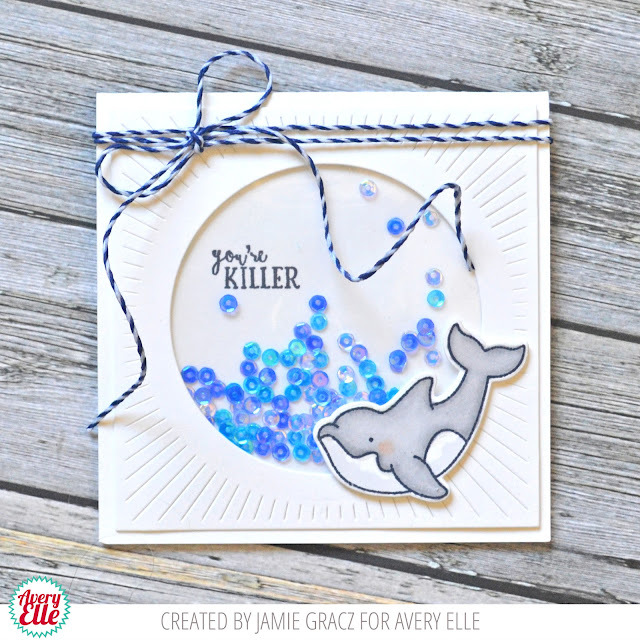 That blue inked and water spotted background is just the perfect backdrop! 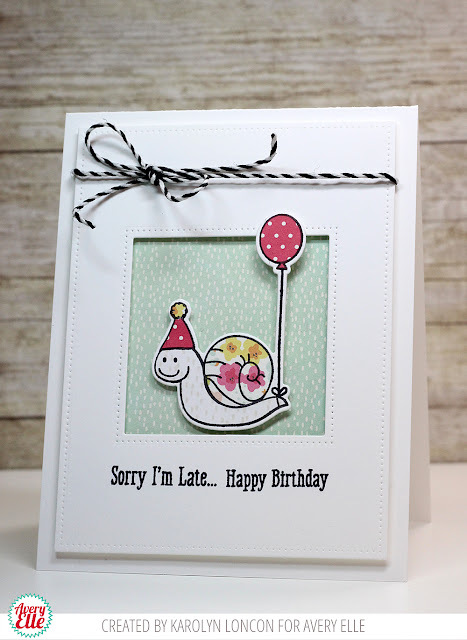 This next card by Heather is so cute. 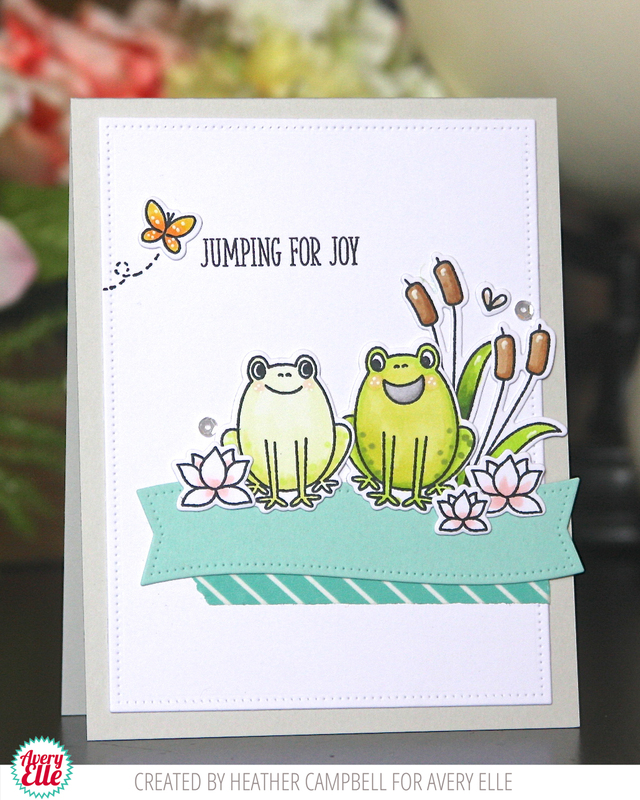 I love how the banner die cut strip is layered with flowers and cat tails that surround the frogs. 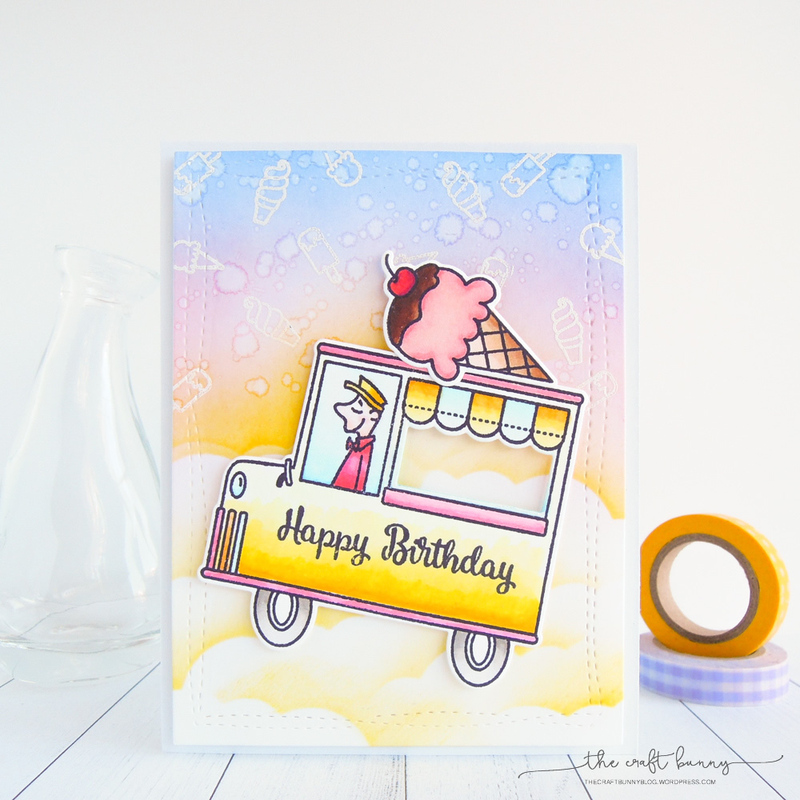 This next card by Heather is so fun. That chick is really working hard. :) I love how she looks inside that frame! This next card is also by Heather. She created a photo frame out of our Double Pierced Rectangle and Double Pierced Square dies. This is a clever way to get even more looks out of these dies. I love how this cute snail looks inside of it. I have one last card to share by Heather today. I love how these fish look against that ombre background. This is the perfect card to send when you need to brighten someones day! Thanks Heather and Ashley for sharing with us today. You are awesome! Thank YOU for stopping by to take a peek. Have a great day! Hello! I have the pleasure of sharing this serene card by Amy with you today. I love the combination of the soft grey coral, starfish, shells and the pretty blue background. Sympathy cards are often the hardest for me to make and this one is just perfect. Thanks Amy for sharing this fabulous card with us. Thank YOU for stopping by to take a peek. Have a great day! 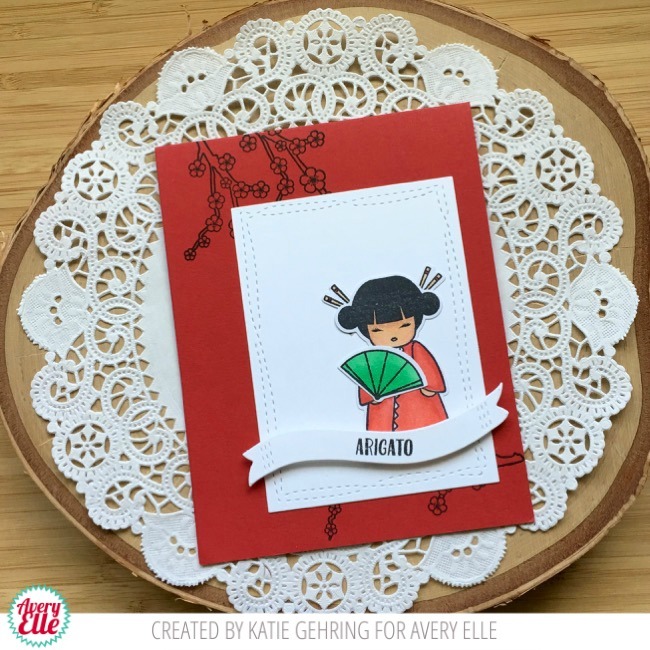 Welcome to Day 2 of the Pretty Pink Posh and Avery Elle Blog hop. We are teaming up with our friends over at Pretty Pink Posh to bring you two fabulous days worth of inspiration and prizes! Be sure to check out all of the designers' posts! You will not be disappointed!! There are 2 $25 Pretty Pink Posh gift certificates and 2 $25 Avery Elle gift certificates up for grabs. Winners will be picked randomly from comments posted along the blog hop. Comments must be left by July 24, 2016. Winners will be announced on the PPP and Avery Elle blogs. This giveaway is void where prohibited and you must be 18 years old or over to enter. 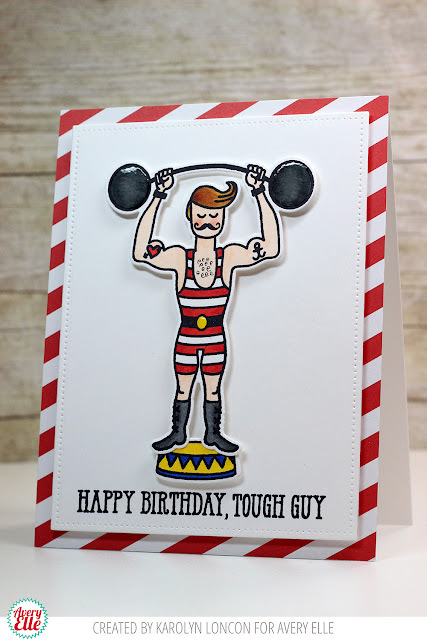 I created another shaker card similar in design to my project from yesterday. 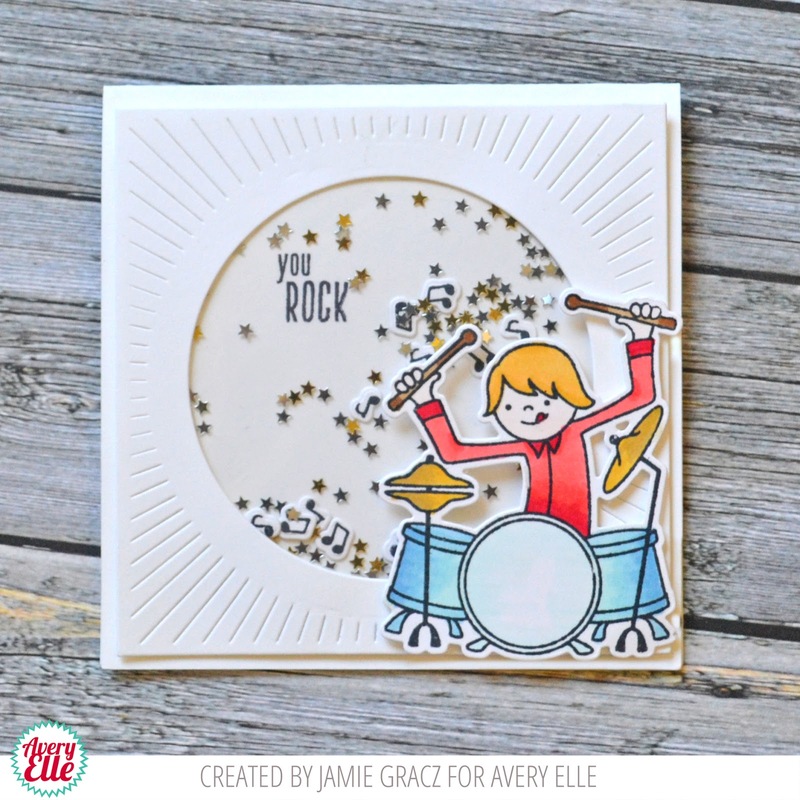 I love how cute this little drummer looks with Pretty Pink Posh's Silver Mini Star Confetti and Gold Mini Star Confetti swirling around him. If you haven't tried Pretty Pink Posh's star confetti yet you really must. I love how tiny and fun the stars are and they come in great colors - silver, gold and iridescent. I have them all!! Okay, off to Yoonsun you go now. Happy Hopping!! Thanks to Paulina, the Pretty Pink Posh designers and the Avery Elle designers for the terrific inspiration these past two days! We had so much fun! Thank YOU for stopping by to take a peek. Have a great day! Welcome to Day 1 of the Pretty Pink Posh and Avery Elle Blog hop. We are teaming up with our friends over at Pretty Pink Posh to bring you two fabulous days worth of inspiration and prizes! Be sure to check out all of the designers' posts! You will not be disappointed!! There are 2 $25 Pretty Pink Posh gift certificates and 2 $25 Avery Elle gift certificates up for grabs. Winners will be picked randomly from comments posted along the blog hop. Comments must be left by July 24, 2016. Winners will be announced on the PPP and Avery Elle blogs. This is void where prohibited and you must be 18 years old or over to enter. 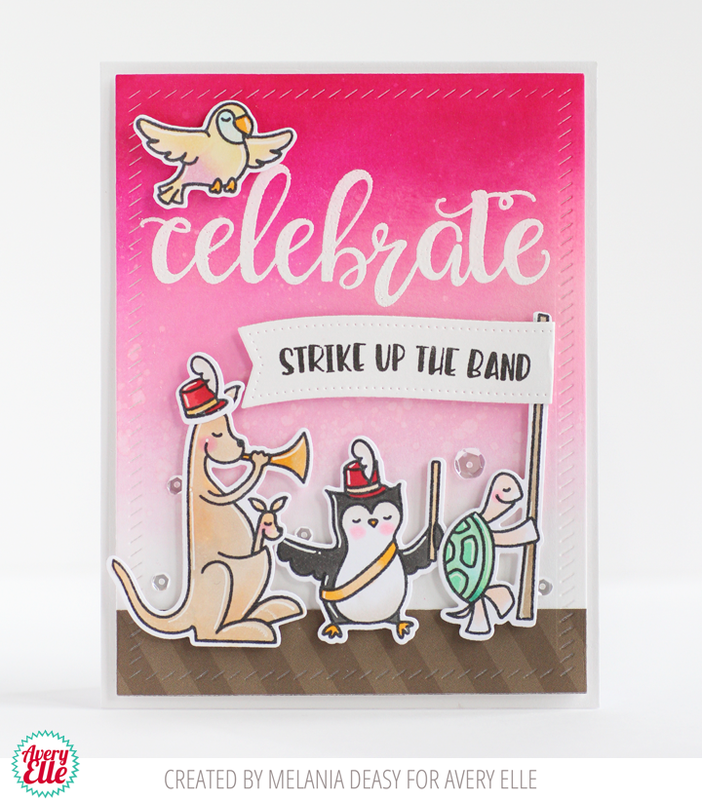 I created this cute shaker card for today. Our whale looks great swimming among all of those blue sequins. Have you tried Pretty Pink Posh's sequins and embellishments yet? They have so many gorgeous colors and are of the best quality! I highly recommend them! Paulina, the owner of Pretty Pink Posh, is so sweet too - it is a bonus to support the hard work of such a lovely person! Okay, you are off to Heather now. Happy Hopping!! Thanks for stopping by to take a peek. Be sure to come back tomorrow for even more Pretty Pink Posh and Avery Elle Inspiration! Have a great day! We spotted another fun project in our flickr group this week. 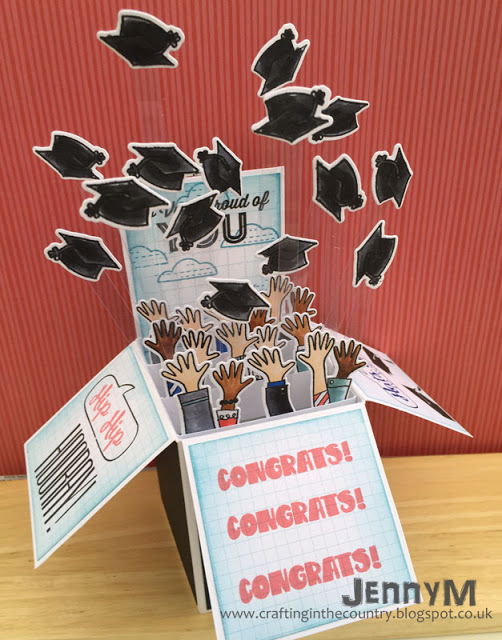 Check out this box card that Jenny over at Crafting in the Country made using our Hats Off clear stamps. Isn't it amazing? I love how the hats look like they are floating through the air!! For more details be sure to check out Jenny's blog here. Hello! I wanted to take some time over the next few weeks to highlight some amazing projects created by YOU. Check out this fantastic card that Blue Marine Craft posted on our flikr group! 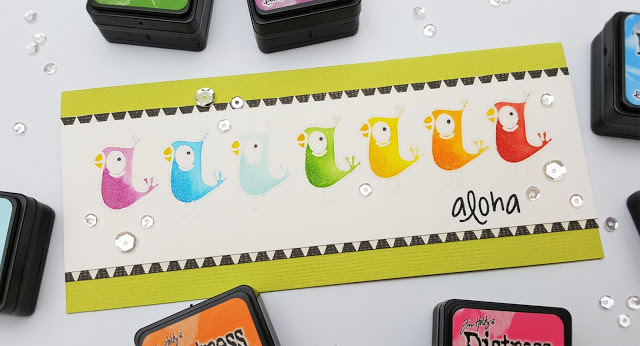 I love this rainbow of birds from our Tweet Tweet clear stamps. For more details and inspiration be sure to check out Marine's blog here. I have two fun cards to share by Ashley today. They are just the cutest! I love the subtle blue shaded background of this first card. It really makes the fish pop. This is terrific! This next card is too sweet! 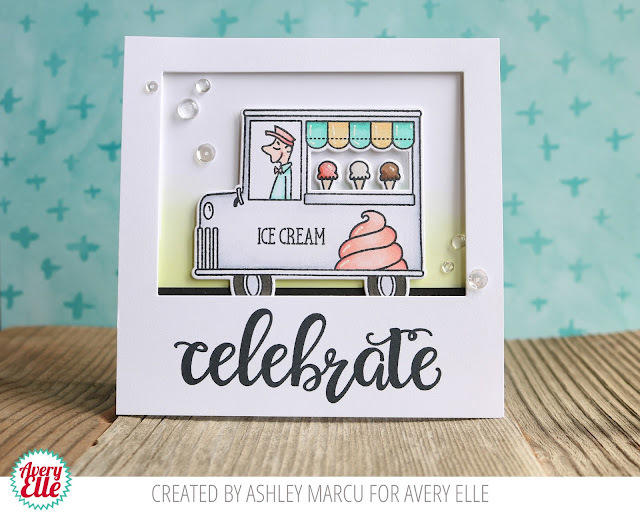 I love how Ashley colored the ice cream truck and cones. They look great with that large sentiment! Thanks Ashley for sharing with us today. Your cards are awesome and so are you! Thank YOU for stopping by to take a peek. Have a great day! Hello! Melania is sharing with us on the blog today. Check out her amazing cards! I absolutely love this first card. The animals look adorable marching across the front of the card. The inked background and clear sequins are fantastic finishing touches. I love how soft and pretty this next card is. The pastel colors look great together and that scallop frames this cute girl perfectly! Thanks Melania for sharing with us. You are awesome! Thank YOU for stopping by to take a peek. Have a great day! Caryn and Yainea have some fun inspiration for us today. Check it out! 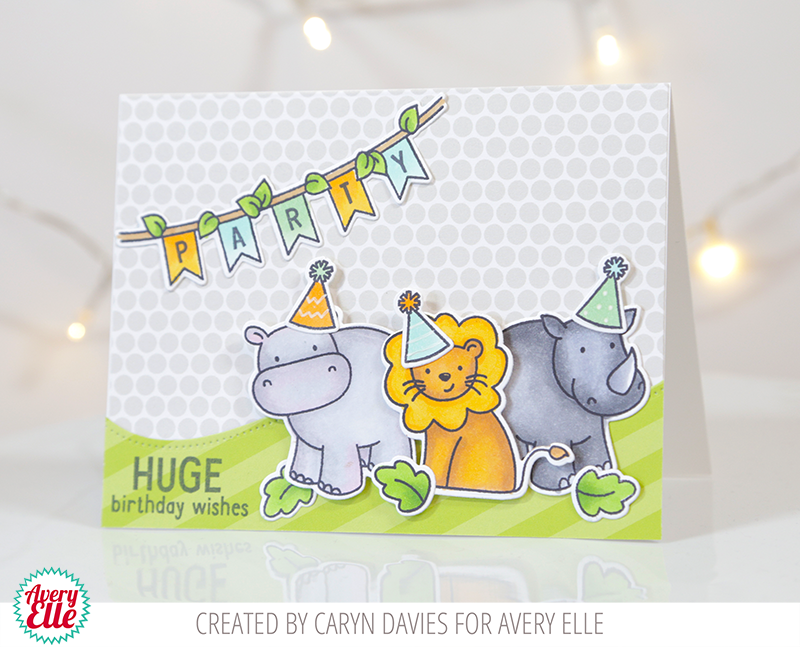 Caryn created this first cute birthday card. I love how adorable all of the animals look with their party hats on! Yainea created this next card. 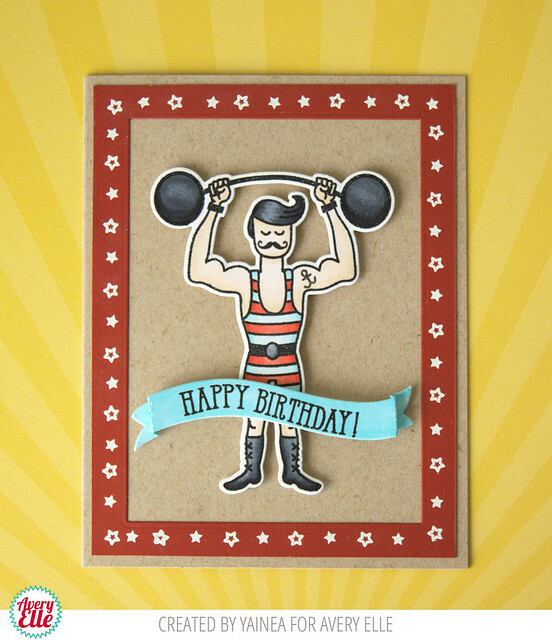 I love the star frame she created around our strongman! This is just fantastic! Thanks Caryn and Yainea for sharing with us today. You are amazing as always! Thank YOU for stopping by to take a peek. Have a great day! Hello and thanks so much for stopping by the Avery Elle blog today. Check out the inspiration that Karolyn and Katie have for us on this fine Friday!! 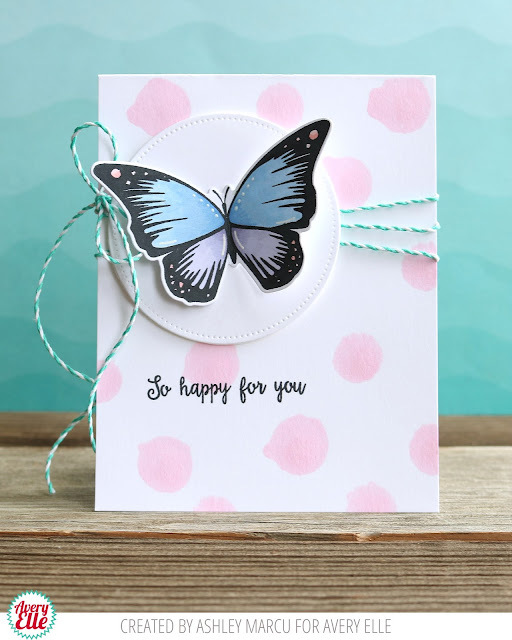 Karolyn created this first clean and simple card. Her bold color choices really make this card pop! I love the circus feel that she was able to create! 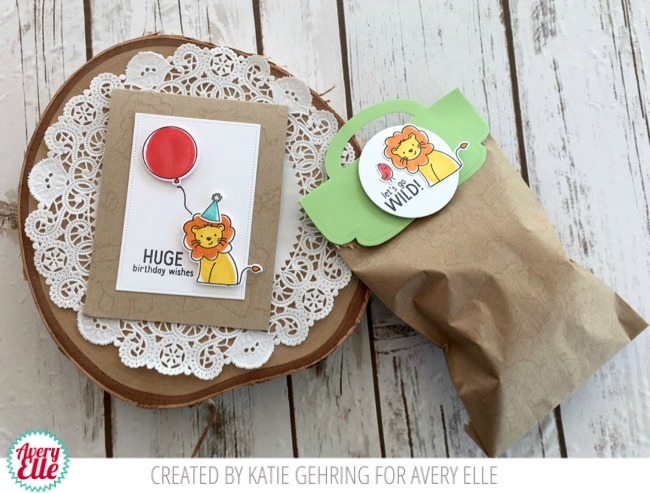 Katie created this next card and treat set. I love how cute they look together. This is a great way to give a birthday gift for that special someone! Hello! 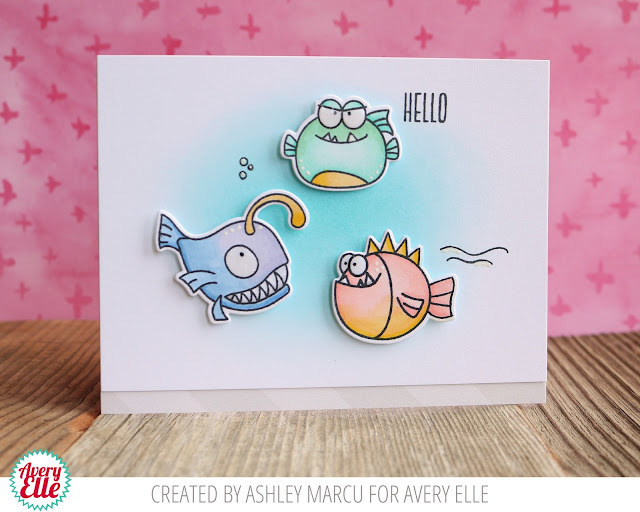 I am popping in quickly today to share these two cards by Heather and Ashley. Take a peek. Heather created this first card. 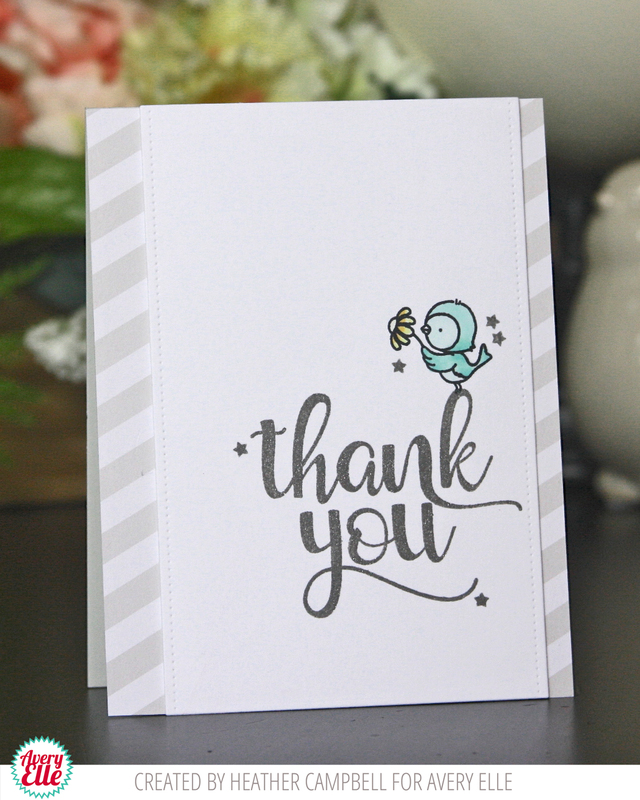 I love how she added that sweet little bird to embellish and customize the large sentiment. This is clean and simple and just terrific! Ashley created this next card. I love how the large pink polka dots look against that pretty butterfly.